We print below, edited for publication, the intervention of New York Spartacus Youth Club member Jonah Roshak at the September 27 Spartacist League/Spartacus Youth Club forum, Defend, Extend Gains of Chinese Revolution. A central part of protests over the carnage in Darfur has been calling for divestment from the Chinese state-owned oil company PetroChina, which has interests in Sudan. We oppose these calls and say: All UN/African Union forces out of Sudan! U.S.: Hands off the world! 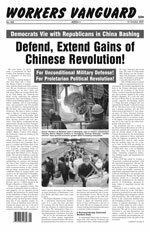 I want to draw the attention of everyone here to another threat against the Chinese workers state. The talk covered military threats from U.S. imperialism and Australia and Japan. It covered economic threats. But theres also a third one—its very big now on college campuses among the left, which is very class-unconscious and influenced by the theory of the death of Communism following the collapse of the Soviet Union. This threat is rooted in basic anti-Chinese anti-Communism, couched in human rights talk. Im speaking, of course, about the movement focused on the Darfur region of the Sudan. Its a very sinister lash-up of forces between those who are genuinely disgusted by whats going on there and those who are attempting to use this as a bludgeon to attack China with. This is very cynical. When Sudan launched a war against the peoples of the South, the U.S. government had absolutely no problem with that and said the southern Sudan Peoples Liberation Army was Communist-backed. Right now the save Darfur movement is comparable in a way to the cynical use of cases of Soviet Jews as a rallying cry for counterrevolution in the Soviet Union. Counterrevolution made the conditions of everyone, especially minorities, that much worse. One of the imperialists interests is to remove Chinese influence from Sudan, the largest country in Africa, and extend imperialist penetration even further into that part of the world. But they also aimed to isolate the Chinese workers state and to launch a counterrevolution against the 1949 Revolution. Right now whats needed is to expose movements like the save Darfur movement as a bludgeon to be used to further imperialist interests in Africa and to isolate and weaken the Chinese workers state.